Calling a pest control company is only necessary if you have a very large ant infestation in your home. For all minor infestations, it’s quite easy to get rid of ants and keep them away with a few simple DIY solutions. Learn more about what you can do to get rid of ants and keep them out. Ants are relatively harmless, but can be a real nuisance to have in your home. 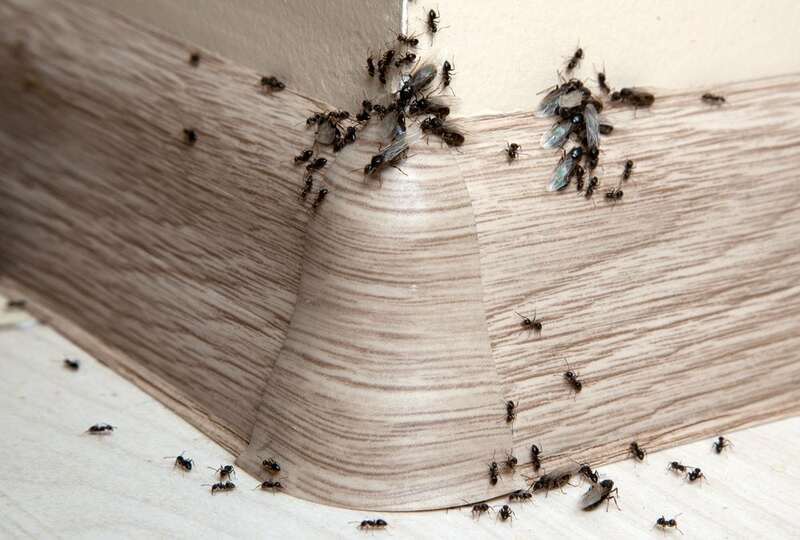 Follow these simple DIY solutions to get rid of ants. Make an effective ant bait trap using borax and powdered sugar. Mix 1 part borax with 3 parts powdered sugar, place the mixture in small open containers close to the ants’ pathways. The ants will be attracted to the sugar, confuse the borax for sugar and carry it back to their colony, where the borax particles will slowly kill the ants. Apply a mixture of cinnamon and cloves at all entrances and areas where you have seen ants. Cinnamon is an effective DIY ant repellent and the mixture will also keep your house smelling nice! You can also add cinnamon essential oil to make the mixture more potent. Spray lemon juice near entrances and areas where you have seen ants. The acidity and sourness of lemon juice acts as a strong deterrent. Draw lines with chalk around the outside of any entrances. Ants have a strong dislike for calcium carbonate, which is what chalk is made of, and will stay away from it. Peppermint has a strong smell that acts as an ant repellent. Soak cotton balls in peppermint essential oil and place them in areas where you have spotted ants. You can also mix peppermint oil with water and sprinkle the mixture in ant infested areas. Spray windows, doorways and other ant entryways with a mixture of white vinegar and water. Ants detest the smell of vinegar and will stay away from those areas. You can also add peppermint or lemon essential oil to make this mixture more effective. Diatomaceous earth (DE) kills ants by drying them out. Sprinkle DE around the perimeter of your home and in ant infested areas. Minimize entry points by sealing around windows, doors, and pipe, wire and cable points. Practice good sanitation and clean kitchens and bathrooms often. If your ant problem becomes too large to manage with these DIY tips and tricks, you will need a professional pest control company to take care of the situation. At AGJ Pest Management, our professional pest control technicians can inspect your home and use safe and effective practices to get rid of your ant problem once and for all. Call 0421 533 002 to learn more about our ant extermination services, or enquire online.